We’re back – 2017 Season Recap and more! Hi Seagle family! It’s been a while since you’ve heard from us here at the blog. But rest assured, the blog is BACK, and we’re so excited to share what’s been going on for the last few months!! Seagle’s 2017 season was a huge success, featuring two works never before produced by the Colony. The season opened with Adam Guettel’s The Light in the Piazza, a lushly lyric Tony-winning musical set in Florence, Italy in the 1950s. 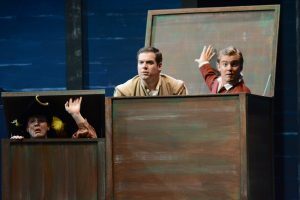 With this production we warmly welcomed stage director Jay Lesenger, formerly of the Chautauqua Festival and Northwestern University, to Seagle for the first time. And while our productions are usually performed with two pianos, this show was made even more magical with the presence of harp, played expertly by Karlinda Caldicott, which Guettel used to illustrate the romantic Italian sunlight. 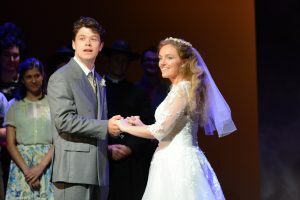 This summer also featured the piano-vocal premiere of Herschel Garfein’s Rosencrantz and Guildenstern are Dead, based on the comedic play by Tom Stoppard. The singers had their work cut out for them with Garfein’s complicated score, but conductor Andrew Bisantz and music director Jennifer McGuire did a masterful job of enabling our emerging artists in bringing the score to life. This show was also a bit of a low-voice lovefest, with two baritones, a bass-baritone, and a mezzo-soprano forming the core principal roles. At turns silly or serious, “R&G” was an exciting project and we look forward to hearing about the work’s future successes. 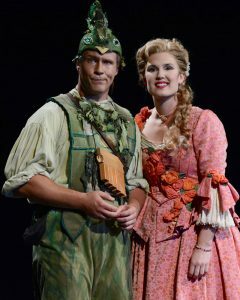 After the hilarity of R&G, audiences enjoyed a classic – Die Zauberflöte (The Magic Flute), Mozart’s beloved singspiel. Our singers had a wonderful time working closely with director Kyle Lang, whose modern dance background informed movement, lighting, and even special effects like a human-chain serpent and the fire and water trials in fascinating and breathless ways. Audiences enjoyed incredible performances of some of opera’s best known arias, from Tamino’s love ode “Dies’ Bildnis ist bezaubernd schön” to Pamina’s haunting “Ach ich fühl’s” – and who could forget the fireworks of the Queen of the Night in “Der Hölle Rache?” Although the subject matter deals with mature themes like suicide and revenge, the bird catcher Papageno was always there to make us laugh. Make no mistake – these talented singers would have made Mozart proud! We love a chorus number with a kick line! Our season concluded with an old favorite, Lerner and Loewe’s My Fair Lady. Richard Kagey, Seagle’s longtime Director of Productions, has great stories to share about the last time this musical was seen at Seagle – one of our favorites is that the tickets were not sold with dates or seats, as the performances were offered with general seating. So many tickets were sold that by closing night, there were patrons sitting in the lighting loft, in the aisles, and even craning their heads in from outside! This summer’s production, in fact, sold out before the summer even began. While not exactly a traditional love story, My Fair Lady has its heartwarming moments, and our artists had an especially fun time mastering the Cockney accent. And we made sure to get Alfie Dolittle to the church on time! 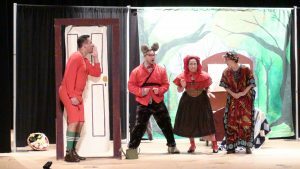 In addition to our mainstage season, several artists participated in the touring production of Little Red’s Most Unusual Day, an imaginative retelling of Little Red Riding Hood. The singers performed at community venues throughout the North Country, including the Boathouse in Schroon Lake. Audiences of all ages loved the story – especially the heroic Forest Ranger Dudley and the frightening Mr. Bigbad. Nevertheless, all good things must come to an end. In August, the majority of our artists departed for home, but four singers and a pianist remained to produce Seagle’s fall-season shows. 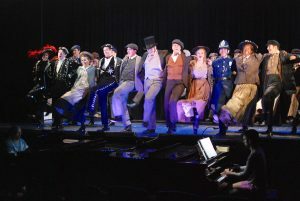 This year’s lineup included a Broadway revue entitled Boulevards of Song as well as a reprise of Little Red’s Most Unusual Day. The troupe traveled all over the North Country, visiting schools and community theaters in towns from Chazy to Glens Falls. It’s a quieter life in Schroon Lake in the fall, and our artists enjoyed the slower pace — and getting to live in the brand-new staff housing on campus. Aside from the annual goings on, there are a few other notable things that took place this summer on the hill. 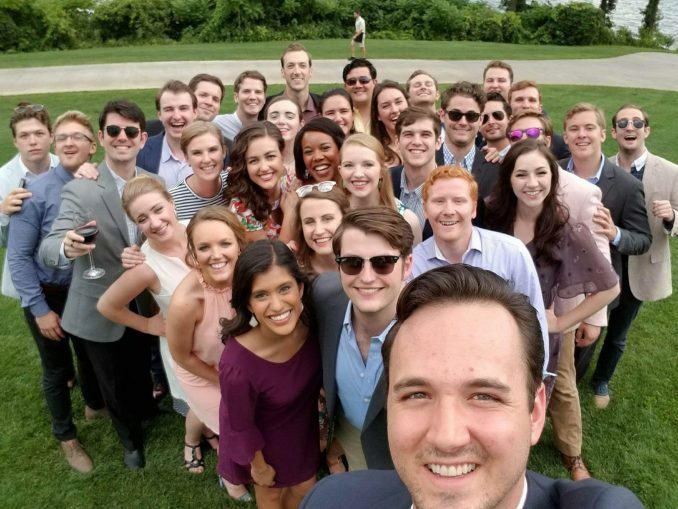 This year Seagle announced its new initiative, the American Center for New Works Development @ Seagle Music Colony, and hosted the workshop of a new opera by Zach Redler and Jerre Dye entitled The Falling and the Rising. The story, told by five singers playing multiple characters, deals with the experiences of soldiers returning home from war in the modern era and learning how to assimilate back into everyday life. This project was particularly special as it was sponsored in part by the U.S. Department of Defense and all the singers were members of the U.S. Army Soldier’s Chorus. One Soldier’s Chorus member in particular, SSG Ben Hilgert, was instrumental in bringing this project to life, and his enthusiasm for the project was infectious. After a week of intense daily rehearsal, the work was performed with piano and afterwards the audience was invited to give feedback and ask questions. It was a rousing success, and we look forward to seeing the work’s official premiere at Texas Christian University in April 2018. Many of you recognize, remember, and have fond memories of the various buildings at 999 Charley Hill Road. One, however, came into the spotlight this fall. Attached to the old, now-dilapidated laundry building is a separate room which housed Seagle Music Colony’s first African-American student in 1957. Fulton Fryar was his name, and he left his mark on the colony in a very literal way in the form of paintings on the walls and door of his room, which he affectionately referred to as “The Closet.” Full details on the story can be found here, here, and here. The laundry building has since been demolished, but Fulton’s Closet will be preserved for future generations at the Adirondack Experience in Blue Mountain Lake. Phew, what a season it has been! It’s hard to believe the holidays are almost upon us. Schroon Lake has already seen its first snow, and the snowbirds have left town for warmer climes until next year. We’re immensely grateful for your support and patronage over the course of the summer season, and this time of year we humbly ask you to help us keep making these magical musical moments happen. Consider donating to Seagle Music Colony in your year-end charitable giving, and keep an eye out on social media for our Giving Tuesday campaign. That’s all for now – we hope to see you back on the Hill soon!